Sabine Henseler sent this drawing of my mother riding in Boa Horse Boots. Not bad for a sketch. 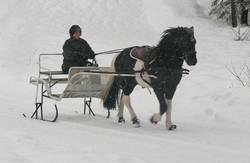 We get many calls during the winter months about the traction of horse boots in snow and ice. Hoof boots work great in snow and icy conditions and prevent the snowball effect common with iron shoes. 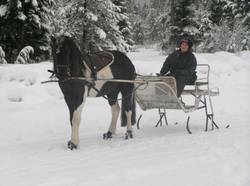 Click here to see a horse pulling a sleigh through the snow with Boa Horse Boots. Studs can be added to all EasyCare hoof boot models for extra traction in the snow. Here is a short video for installing the studs. I just received a couple new Boa Horse Boots with some of the latest knobs and dial systems from Boa Technology. They look very promising and should enhance the current design in many ways. I'll let you know how they perform over the next couple months. I spent the day in Denver with our partners at Boa Technology. 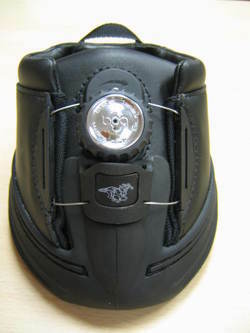 Boa Technology manufactures the patented dial and lacing system used on the Boa Horse Boot. Boa Technology has had some exciting improvements over the last couple years and they now have Boa systems in many different industries. Companies like The North Face, Specialized, and Pearl Izumi are just few that have added the Boa system to their product lines. These new Boa partners have helped push new design concepts that will be available in the equine industry soon. Expect some exciting changes in the Boa Horse Boot for 2007.